British Prime Minister Tony Blair arrived in South Africa on Thursday, with plans to meet with anti-apartheid icon Nelson Mandela during this final leg of his farewell tour to Africa. 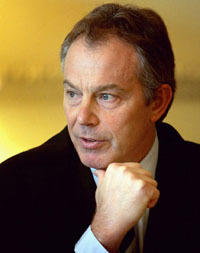 Blair, who had flown in from Sierra Leone, was due to give a speech described as an important policy statement at the University of South Africa. He also planned to visit the nation's biggest hospital in Johannesburg. During his tenure as prime minister, Blair tried to raise the profile of Africa, the world's most impoverished and strife-ridden continent, and urged international efforts on aid and debt-relief programs. He has won praise from some African leaders, but others say Britain and other Western countries have not fulfilled promises to lift them out of their grinding poverty. Blair is due to meet with South African President Thabo Mbeki on Friday.